Femunden is Norway's third largest lake and the second largest natural lake in Norway. 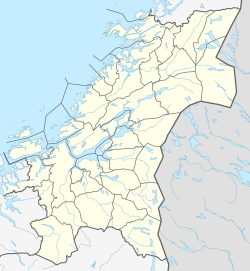 It is located in Hedmark and Trøndelag counties in Norway, just 13 kilometres (8.1 mi) west of the border with Sweden. The lake lies primarily in the municipality of Engerdal (in Hedmark) and also smaller parts are located in the municipalities of Os (Hedmark) and Røros (Trøndelag). Femundsmarka National Park borders the northeastern part of the lake. The 204-square-kilometre (79 sq mi) lake holds about 6 cubic kilometres (1.4 cu mi) of water and reaches a maximum depth of 130 metres (430 ft). The surface of the lake sits about 662 metres (2,172 ft) above sea level. The first element (Fe- or Fem-) has no known meaning, and the last element is the suffix -mund or -und (both are common in Norwegian place names). After Sweden had conquered the parishes of Idre and Särna in 1644 lake Femunden was considered to be part of the border between Norway and Sweden. But this was never officially recognised by Norway (or in reality by the Danish government, since Norway was ruled from Copenhagen in the early modern age), and during border adjustments in 1751 the Femundsmarka area east of the lake was granted to Norway from Sweden. The new (and current) border from 1751 is quite special: For a length of 61 kilometres (38 mi), it makes a completely straight line between the summits of the 1,002-metre (3,287 ft) tall mountain Våndsjögusten and the 1,185-metre (3,888 ft) tall mountain Østerhogna. Straight-line national borders are very unusual in Scandinavia, except in the very northernmost parts. ^ a b Store norske leksikon. "Femunden" (in Norwegian). Retrieved 2011-02-25. Wikimedia Commons has media related to Femund. This page was last edited on 26 March 2018, at 23:11 (UTC).